WARNING: TLDR, skip to post #13100 below or your brain might explode! Our attempts to clone DayStar PDS adapters have been abandoned. I've long thought that this project needs revisiting, so this is an attempt to clean up the drivel I've posted on Mac68k.info and ASK FOR HELP! --Regarding other PowerCache Adapters and their their lack of intervening Logic in adaptating a PDS for compatibility with the IIci Cache Slot. --Notations about missing, contradictory a/o possibly remotely relevant information in the DevNotes and documentation in the Apple Press pubs. --Inferences (WAGs) drawn from noted differences between PowerCache Adapter revisions for the IIsi. --That the Vampire Video implementations in IIci, IIsi, the VRAM enabled SE/30 and the rat's nest of early MoBo Video implementatio seems the most likely culprit. ------ Most of this probably needs to be condensed into a table relating Address Mapping, Pseudo-Slot I.D./interrupt considerations contrasted with the Physical Slot implementations of the various Macs making up what I feel is a relevant sampling. ISTR techknight telling me that the adaptation moves the memory addressing of the SE/30 PDS to another part of the memory map where the IIci Cache Card resides. I don't know how that works, but something of the sort has been done before. I'm taking my usual fumble-fingered stab at developing a ridiculous multifunction card for the SE/30. So of course, I'm looking to make provisions for hanging as much crap off the thing as is humanly/technically possible, interrupt permitting. *** Rearranging the PDS signals to match the IIci Cache card I can crib from DCaDftMF. If the lines for the memory displacement PAL are identified by someone who has an adapter card, I can easily add pads/thru-holes for it to hold in reserve along with the remapped, but unpopulated EuroDin120 connection for such a time as the PAL programming project might be accomplished. Obviously that would need to be done by others. Is it possible to jumper additional interrupt lines from wherever appropriate in the GLUE/NuChip architecture of the SE/30 and its IIcx sire which might then be addressable by an SE/30 with the IIfx ROM SIMM or a hacked variant thereof on board? I've already got plans for jumpering at least 10 lines to the RidiculousCard from the SE/30 MoBo, so WTH? I mentioned this to trag and he said that someone will have to do this eventually. Might as well get started! - power . . .
- device opening . . .
- The absence of some machine specific signals imposes severe restrictions restrictions on your design. I'm guessing that . . .
GAH! that doesn't even make sense to me now! Table fixed below? I think I may have figured out the source of confusion. In GttMFH2e, pp.389-392 list the signals available on the IIci cache slot. The bolded entries are signals Apple placed on the connector for diagnostics purposes only and would be the jumping off point for those "determined to design an expansion card other than a cache memory card," such as the PowerCache accelerators. Hopefully the differences between the two versions will shed some light on the Cloning Project requirements for someone competent. My guess is that later (read faster better, more likely to wind up in a IIsi/SE/30) PowerCache Cards had on-board ROM and circuitry mods circumventing the need for the drastic interventions necessary for compatibility with previous models found on the earlier adapter. I'll also guess that the location of the last remaining IC and pin assignments at U1 on the simplified Rev.2 adapter will be crucial in reverse engineering. ** I wrapped that last bit back around to the top, hopefully it makes more sense that way. GAH! That's the second time I've done something to get a "Document Expired" error! At any rate I hope the above makes more sense than the Mac68k thread . . . likely not. -- High Res Pics of that gen.1 IIsi Adapter in the 'fritter link. -- Any pics at all or confirmation of the existence of the (inferred) gen.1.5 IIsi Adapter with the IC implemented at U3. -- Buzzed connections of any and all above. -- TattleTech NuBus/PDS report from SE/30 with both PDS and Socketed Adaptations for the PowerCache. Interpretation of the drivel above by anyone with a clue? I wish I had a clue, but I get most of what you are saying (just have no idea how to help). I will follow closely as an 040 in a SE30 would be sweet. Me too and thanks! I'm glad you got any of what I was trying to get at, that's an auspicious beginning for one of my threads! It's my quarter-weekly Wednesday crash day and I've been moping around the place in true holiday spirits, but I did come up with what might be an interesting angle of investigation of my Slot $E Borkage Theory. 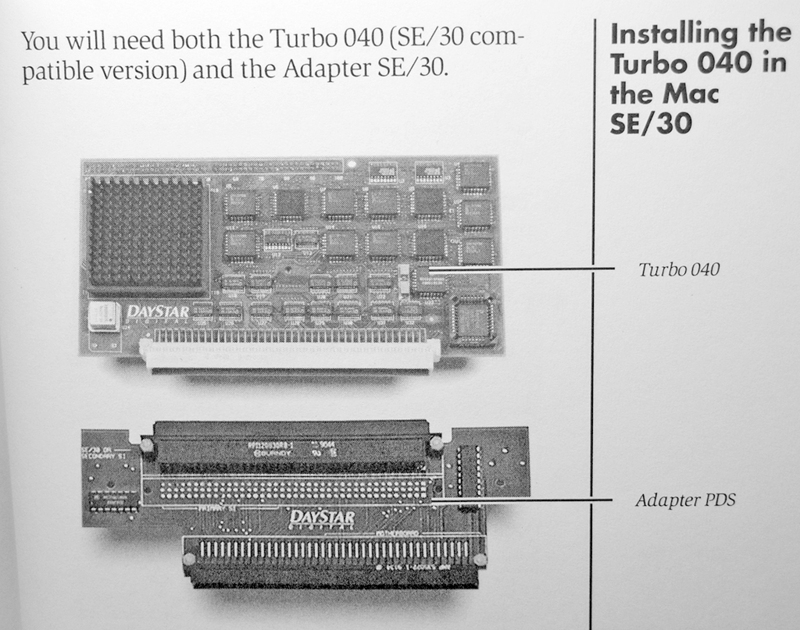 Might putting one of my Futura II/Ethernet Daughtercard combos in Slot $E of a six slot Mac give any indication of what kind of further addressing might be needed for the SE/30's NuBus Signal and the straight up $E PseudoSlot Video implementation? Such would be a convenient example of an additional, discrete functions operating within the Vidcard's $E physical location and PseudoSlot space? The Daystar PDS Adapter as I understand it functionally adapts the IIci cache cards to the 030 PDS. It also has some other bells and whistles that don't seem particularly attention-worthy. FPU and 32k cache are pretty normal. So are you just trying to figure out how to adapt IIci cache cards to 030 PDS for use in the SE/30 like the artmix adapter? I'm not clear what you're asking for. You linked to the same thing twice there. There are several products called PowerCache, but none of them I'm aware of exist in the address space, and do not drive a video subsystem and do not conflict with Slot E. Is there any technical reason you believe it does? AFAICT, you've got a very long chain of speculation going, all of which is predicated on anecdotes. Are you sure you aren't confusing nubus on SE/30 with IIci cache card on SE/30? 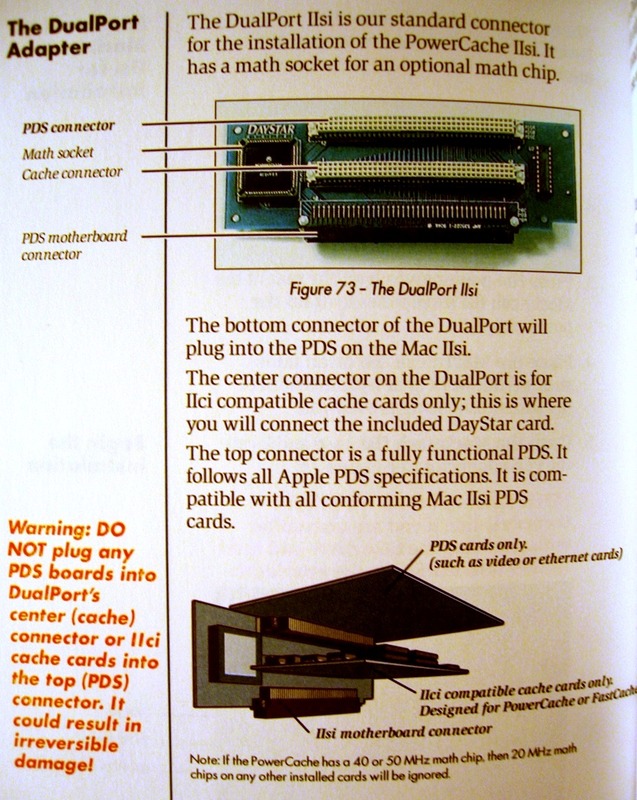 The Daystar PDS Adapter as I understand it functionally adapts the IIci cache cards to the 030 PDS. It also has some other bells and whistles that don't seem particularly attention-worthy. FPU and 32k cache are pretty normal. Yes, it adapts the signal line mismatch, but the SE/30 (assumption, I've never seen a picture of one) the IIsi and Artmix adapters all require active component intervention to do so. 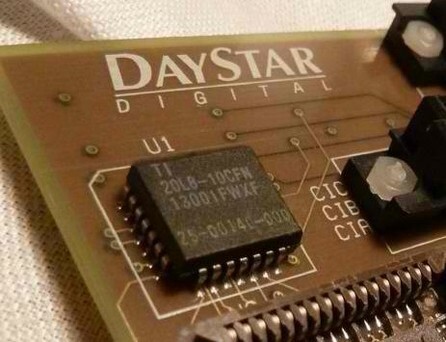 However, the DayStar adapter has no active components on board for the LCIII Slot E -> IIci Cache Slot conversion, only the pin/signal reassignments and some line conditioning are required for that adapter. So are you just trying to figure out how to adapt IIci cache cards to 030 PDS for use in the SE/30 like the artmix adapter? Exactly! gamba and co. gave up on that project. I mentioned "clean room cloning" of the IIsi adapter to trag in PM. He said it was probably something "someone" would need to do eventually. oopsie: http://www.applefritter.com/node/10199 . . . on further examination, the double-linked card's not even a PowerCache adapter! There are several products called PowerCache, but none of them I'm aware of exist in the address space, and do not drive a video subsystem and do not conflict with Slot E . . .
Is there any technical reason you believe it does? Yep, I don't think the PowerCache accelerators interfere with any conventional implementation of Slot E. I think that Apple's implementation of the SE/30's Video System at PseudoSlot $E is anything but conventional. Why would Apple's engineers feel any need to work within the confines of Slot Manager guidelines to implement video in a "Slot" that won't exist in hardware? I don't think they did and I think that's the problem DayStar needed to address with active components these adapters and not on others. Are you sure you aren't confusing nubus on SE/30 with IIci cache card on SE/30? Absolutely certain, different issues entirely. NuBus on SE/30 is a set of black boxes: the ICs and ASIC that need to be connected. That would be to each other, the SE/30's PDS and likely jumpered to the MoBo if I follow the Mac IIx architecture adapted from the Mac II schematic. Project30 (NuBus in SE/30) is unconnected to the cloning project, other than the PCB passing the PDS signals to a (proposed) PowerCache adapter clone at the top of the card. I'm passing the PDS up to the top of the card and out of its side to begin with anyway. If (more likely when) I can't get NuBus up and running in the SE/30, I'll have the layout done for a multiple slot PDS expansion card. The passthru traces will be implemented as fully as possible on the etched sides of the wire-wrap protoboard I'm designing. AFAICT, you've got a very long chain of speculation going, all of which is predicated on anecdotes. It's meant to be a list of the items I've found in the documentation that might be germane, or not. The comparisons I've made between my Daystar LCIII adapters and the IIsi adapter pics on 'fritter stand. This led me to look into the matter of the difference I noted and I turned up discrepancies in the Docs along with what I think might be clues as to what's done in the circuitry on the SE/30(?) and IIsi adapter that isn't required on my LCIII adapter. I'm not exactly looking for help, I'm beyond help when it comes to this kind of thing. I'm really just trying to get the ball rolling. Pictures of a DayStar SE/30 PDS adapter would be great, if any? I surmise it may have been a socket only factory conversion from comments I've read? Pictures of any other adapters having active circuitry, or not, would be a great help. My sample size leaves much to be desired. I'll try to post pics of the LCIII adapter for comparison tomorrow. Thank you very much for taking a look. I really hope this makes at least a little bit of sense to you now. Heh! I knew I'd found a pic of another IIsi Adapter. 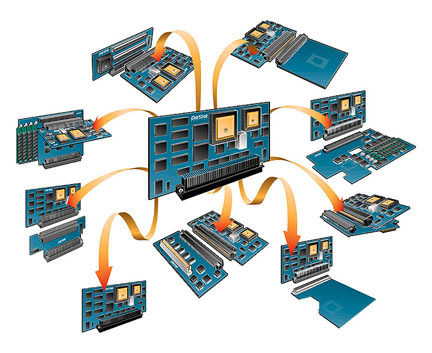 Has anyone got a link to the "Family Tree" illustration of DayStar's PowerCache Cards and Adapters? I've long thought that this project needs revisiting, so this is an attempt to clean up the drivel I've posted on Mac68k.info (see above) and ASK FOR HELP! Can anyone ID any of the adapter/machine matchups from this diagram? My goal here is to finish the Gamba2 adapter cloning project. I think my next step will be be mapping the traces on the four surface/subsurface layers visible on this board in Illustrator. My brain works visually, so let's see if I can identify as many of that active IC's pin assignments as possible to create the (Greek to me) schematic that other brain's thought processes interpret so well. This should provide some good clues as to the identity/function of the mystery IC under that "1400" label. Again, this project could mistakenly be described a clean room reverse engineering of the function of the IC Artmix achieved for their SE/30 board from what's likely the same data available for that successful project. It's actually an extension of the Gamba2 project relevant to cloning as many of DayStar DIGITAL's PowerCache adapters as possible, beginning with the IIsi adapter and then modifying for the SE/30. This project would be just the first step in that endeavor. It's also an important adjunct to my pet Project 30. As the goal is to clone the IIsi TwinSlot PowerCache adapter, it might differ significantly from the SE/30 PowerCache adapter. Complications resulting from differences between available interrupts (actual slot assignments) and the PseudoSlot ID assignments of Video implementations in different Macs appear to me to be the crucial differentiation reflected in circuitry present in the various adapters in the family tree diagram above. Of course the pad for the small IC on the other end of this TwinSlot card is populated . . .
. . . with a sticker covered IC! TIBPAL20L8-10CFN Datasheet - sort of, gotta hate these specsheet hijacking outfits. Results so far from: Are there Chips on your PowerCache Adapter? AFAIK, every Mac that has an implementation of Slot ID $E in any form except the LCIII and IIci require active adapters. IIci doesn't count because its implementation of cache memory space (possibly NuBus SuperSlot memory space is involved?) and $E implemented in NuBus are compatible by (definition) design. LCIII is a special case because its PDS is an oddball hardware implementation of a full '030 PDS connector at Slot ID $E. Installation of the PowerCache adapter in its PDS precludes any other use of $E, hence no possible conflict and its passive adapter. Members of the Mac II series have NuBus implemented in Slots $9-$E. The IIci is an oddball, with slots $C-$E implemented in NuBus. IIcx follows the pattern of its big brother the IIx, implementing the first of its three NuBus slots at $9-$B. No implementation of Slot ID $E is made as a physical slot or a pseudoslot in its design. No possible conflict there means only a passive adapter is required for the PowerCache. At first blush it seems to me that placing Video Memory at $B either makes room for it or places it out of contention with main system memory access? Having it located in the $B space also puts it out of contention with memory addressing from NuBus access in slots $C-$E. ISTR reading that NuBus was "chunked" three slots at a time, which makes some sense to me in looking at various implementations. Question: does it make sense to anyone else to see IIci system memory in chunk $0, video memory in chunk $9-$B and NuBus in chunk $C-$E? Might it have to do with some kind of "branching" of the CPU and I/O interrupt/interrupt level setup? The Cache Card is located in memory at $5200 000 - $52FF FFFF so I'm lost, where the f**k is that?!!!! I am curious if the active adapters use any of those signals. Are they wired to the PAL? Without ever actually seeing one, I'm absolutely sure the "read fuse" is blown on the Artmix board's PAL is blown. IIRC, the gentleman who did that work patented his method. Dunno, but out of respect and admiration for his work, I'll be upset if anyone tries to reverse engineer his solution. I've never actually seen an ACTIVE PowerCache adapter of any kind IRL, but I'm guessing they're PALs are all read-proofed as well. It wouldn't surprise me a bit if Logic Probing the single PAL on the (latest rev?) IIsi adapter might have been involved in the Artmix development process. Even if so, I'm maintaing a "clean room" cloning process regarding the Artmix board. Dunno, the only time I've ever been involved in Logic Probing was the late 80's and it was my partner who did the electron pushing and digital reverse engineering for that project. I remain blissfully ignorant of such technicalities, I was the idea guy, coming up with the original invention and the visually oriented breakdown that finally led to decrypting/reverse engineering the target machine's Font format. Continuing this gamba project is fun in itself, but for me it's really an icing on the cake adjunct to Project 30. Even if so, I'm maintaing a "clean room" cloning process regarding the Artmix board. Fair enough, and surely more satisfying when you reach your goal! MicroMac and Diimo also made PDS-Cache adapters. All very similar to the last rev. 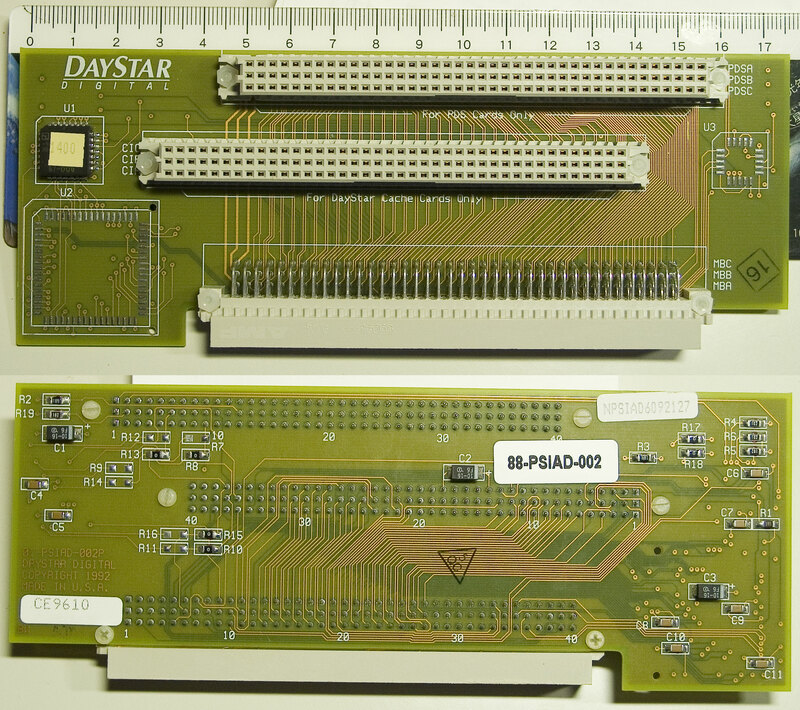 Daystar and Artmix boards. I would hazard a guess they all use the same logic manipulation. Thanks so much for your input, I'd not seen either of one of those. They do look like the PowerCache/Artmix single chip implementations. Since the thruholes for what would normally be the IIsi's Cache Slot for the accelerator are unpopulated, it may actually be installed correctly for use in the SE/30. That leads me to think that the smaller IC might be there to remap the slots' pin assignments to enable a single PCB to be adaptable to either IIsi OR SE/30 configuration. Dunno, this guesswork is fun! At this point I'll take any info I can get. Buzzing the connections of any of these boards would be very helpful. If the Artmix board is handy to anyone, just the pin assignments of the PAL indicating connections to pins on the PDS & Cache sides would be within the bounds of this project. As you say, they all do the same thing and comparing pinouts of all available would be fascinating to me, if more than likely redundant as you implied. From your pic, it appears that MicroMac's accelerator had the FPU implemented on the Accelerator, making it the most simple PCB layout. Yeah, it seems the only pictures of them I could find were taken with an old Sony Mavica with some butter on the lens. I can't interpret the part number from the PAL at all. 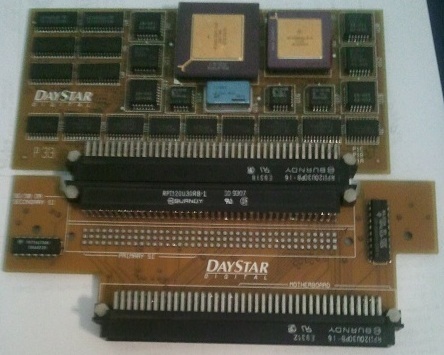 The Daystar card has a sticker on it, and of course, I couldn't find the solder side of that board either. The Artmix card has some pretty high resolution pictures of it online, so I was able to see the part number for that example, GAL16V8D-15LP (data sheet). Easiest thing to check first is if Pin1 on that PAL is connected to PDS 38A or 38C. That would at least confirm the timing source. Great info there, this is really nice for a change! I usually wind up only talking to myself in these threads. edit: just noticed that adapter is advertised for use with an '040 accelerator. That neatly explains the adapter's lack of an FPU socket. Had quick feedback from BadGoldEagle over at 68kMLA. He posted this pic of the Socked version of the PowerCache for the SE/30. It looks very much like there may be a PAL located between PMMU (built into the 68030) and the Cache ICs*** at U22. It may be looking like the Socketed PowerCache has the same kind of memory address/Slot ID issues as the Universal PowerCache does in the the IIsi/SE/30 PDS. I hope he pulls/has pulled that Maxell bomb! ... The Artmix card has some pretty high resolution pictures of it online, so I was able to see the part number for that example, GAL16V8D-15LP (data sheet). So if you look closely at the photos posted on Flickr, we can make out the traces of the active component. The top right pin looks to go through a resistor, then to the PDS connector A38, which is the CPUCLK signal. My guess the signal is too "hot" to go directly to the active chip, so it passes through a resistor firstly. But more importantly, it lets us know the orientation of the chip, so that pin 1 is the top right (on the solder side) of that picture. The next pin down (#2), we can follow the trace again to the PDS connector A7, which is STERM. Pin #3 goes up to the danger zone, and branches off to a few locations. A10 on the PDS passthrough, and B29 on the CACHE slot. Those are both BGACK. It also goes to a resistor, but I can't see what that resistor is connected to. Pins 4-10 look unconnected, but the data sheet shows pin 10 as ground. Moving to the other side, bottom left (pin11) looks unconnected. Pin 12 leads to the PDS connector A10, which is again BGACK. Pin 13 leads to the bottom jumper. That jumper is closed, but I don't know what it goes to. Pins 14 and 15 look unconnected. Pin 16 goes through a resistor, then up to the CACHE slot, A38 which is the CPUCLK. Pin 17 goes through a resistor, then up to the-- and I am guessing here, because of the black tape on the picture,but I would assume that trace won't cross the other traces on the same plane-- anyway, up to the PDS passthrough slot, A38 which is also CPUCLK! Pin 18 goes up under the tape again, but I will assume stays to the far right and connects with the CACHE slot, C2, which is STERM. Pin 20 looks unconnected, but according to the data sheet, it must be +5V VCC. So, to theorize, the only signals these active cards manipulate is CPUCLK, BGACK, and STERM. EDIT: I found this link about 68K Bus arbitration. I think this is exactly what these active cards are doing, acting as a state machine and controlling the clock to the connected devices. Thank heaven, somebody is helping out! I'll take a look tomorrow, it's time for bed. Just spent about an hour of quality time with the vacuum de-soldering gun. THX very much! 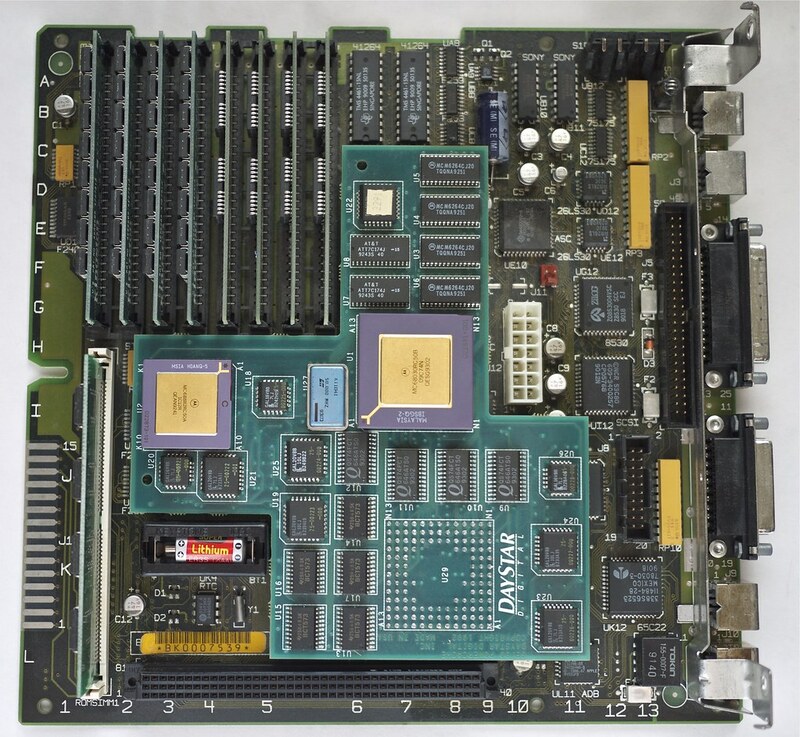 That bus arbitration link is just the kind of thing I need, not only for this project, but for adapting the IIsi NuBus card to the SE/30 as well. Research lines are most definitely on a convergent path for these two projects, gotta love it! Did I post this link over here yet? TheByte article: How the Macintosh II NuBus Works is crucial to my getting a handle on the IIsi NuBus in SE/30 problem. : 1) When any device wants the bus it pulls BRn low. : pulls it low and releases BRn. : 4) The CPU then releases BGn. : why the extra BGACK signal? forwards a modified BG to the next device, and so on. a copy of the incoming BG signal. immediately sees BG asserted and assumes it controls the bus. requestor, which now also assumes that it can have the bus. will then have to wait until the bus is free again. Maybe it's better to describe it as the accelerator's cache accesses contending with the video subsystem for control of the bus for the same $E location. This jibes well with my theory on Macs with and without active adaptation for the PowerCache being dependent upon implementation of Slot $E. Much food for thought here. I've gotta get a printer up and running, I can't access the Byte article at work to print it ore read it there. Hey, mcd! Any chance you could host that .pdf? BTW: thanks much for your donation of the Mac II Adapter to the cause. I just discovered how great that PowerCache card you included with it was. I'd thought it was a 16MHz card from reading the clock speed suffix on the 68881, never looked at the fine print on Proc or crystal can. 50MHz is da BOMBE! Has anyone heard from bbraun? I've not seen him post and he didn't respond to an email I sent asking how he was doing. I'm getting very worried about him.